A 37-year-old father allegedly threatened to burn down the family's home weeks before a deadly condo fire that left him severely burned and killed two young children, according to court documents. In a temporary restraining order obtained by NBC 7, Nikia Lopez, the mother of the two children, said her husband texted her, "I will burn all of this (expletive) down" in a conversation about a missing mortgage payment. San Diego police say the court documents do not make the father, who has not been identified, a suspect. However, the records are part of the investigation. The pair both owns the condo, according to the documents, but only the father lived there. In the request, Nikia writes that the pair texted briefly about selling the condo, located in the 11000 block of Bernardo Terrace. When she suggested they get a realtor, he wrote, in part, "I will fight you, Nikia. Be ready." After calling her names, he made the threat, according to court documents. In the request for the temporary restraining order, granted on Sept. 18, Nikia also said her estranged husband had an issue with alcohol abuse. "When under the influence, he becomes increasingly aggressive," she said in the document. "He recently threatened to kill me and I fear for my safety." 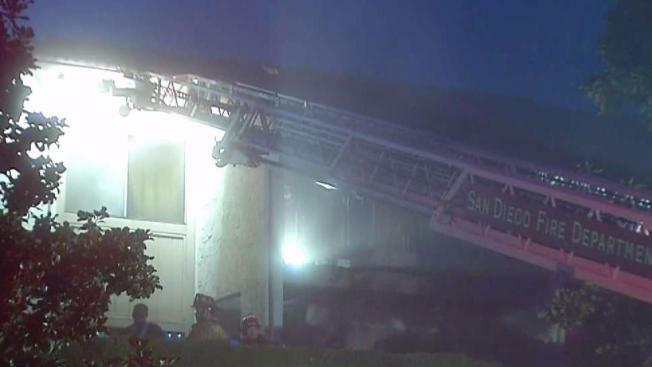 The San Diego Metro Arson Strike Team and SDPD Homicide Investigators are helping with the investigation, but as of yet, no evidence of a crime has been uncovered. The father remains in critical condition but is expected to survive, according to SDPD. A seven-year-old girl and a 10-year-old boy passed away as a result of the fire. They were pronounced dead at the hospital. The children were later identified as Cristos and Isabella Lopez. The Medical Examiner told NBC 7 the information about the children's deaths has been sealed. Investigators are testing items removed from the home, something that may take a few weeks. Sam Trink, a family spokesperson, said she has been aware of the family's troubles. Anyone with information on the incident is asked to call the SDPD Homicide Unit at (888) 580-8477.